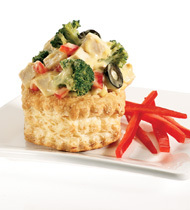 A simple recipe for this classic French dish transforms chicken, broccoli, cream of mushroom soup, cheese and Dijon mustard into a delectable entrée your clientele will savor. Vive la France! 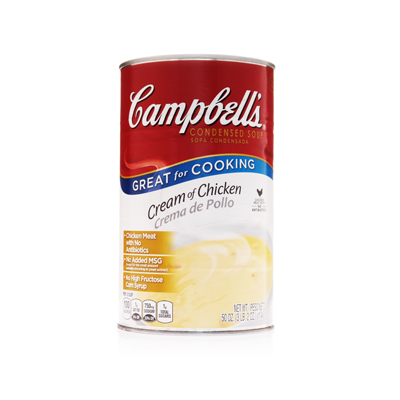 A smooth delicate blend of tender chicken in a creamy chicken stock. Swiss cheese, shredded	 4 lb. 3 3/4 qt. 1. Preheat convection oven to 350°F. 2. In saucepot, combine soup, water, cheeses and mustard. cooked diced chicken, pulled	 14 lb. 4. Divide mixture among three 12 x 20 x 2-1/2 steam table pans. Cover each pan with 1-1/4 cups bread crumbs and spray lightly with cooking spray. 5. Bake for 5 to 10 minutes to brown crumbs. 6. CCP: Hold at 140°F or higher. Portion using 6-oz. ladle (3/4-cup). For a more vibrant upscale appearance, reduce up to half the weight of broccoli and replace it with red peppers, mushrooms and sliced black olives. For operational convenience, diced turkey breast can be substituted for the chicken. For an elegant plated presentation, serve in Pepperidge Farm® Puff Pastry Shells and omit bread crumbs. Swiss cheese	 3.75 lb. 3 3/4 qt. cooked diced chicken	 14 lb.